Profiles > Chris Pirillo - eGuiders. We Search. You Watch. 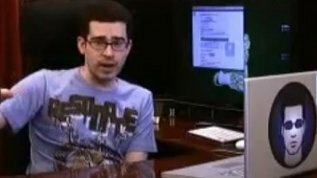 Chris Pirillo has been participating in Internet conversations since 1992, having launched Lockergnome.com as a content publishing network and building Gnomedex to be one of the blogosphere's highly regarded conferences. He publishes a personal blog and lifecast to tens of thousands of viewers, and is a top subscribed partner on YouTube. He also has the most watched show on Ustream.tv of all time. When searching Google for "Chris," his personal site is listed as the first result. He's a monthly columnist for CPU Magazine, and has authored books on business and personal technology. Chris also produces weekly video segments for CNN.com Live, where he offers tech advice to a savvy audience. Are you addicted to Twitter? I know you are - you're constantly refreshing so you don't miss anything. There are tons of clients available to help you keep track of things. There's even a special client that's great to use while at work!